Shana's Art Room : What's next? For those of you who do read this to check up on what your child is doing, let me give you an update. While I'm at it, thank you for teaching your children manners. It is so very important that they have these skills, and a majority of them do. They are polite and kind students. They mean well, want to learn, enjoy class (or so I pretend!) and are sweet children. Thank you for all of your hard work. I'm a mother and sometimes struggle with trying to teach and mold my 2.5 and 4.5 year old boys. It's not easy... It might be easier to let them act inappropriately, but I want them to act like respectful young men. I see examples in many of your children. Anyway... back to art. Sixth graders are taking notes in their sketchbooks on how to draw in one point perspective. 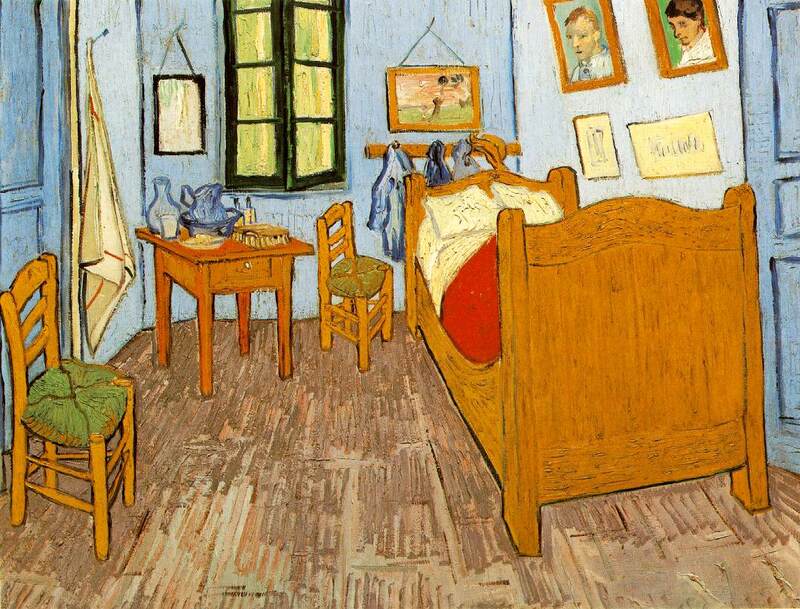 We looked at Vincent van Gogh's "Room at Arles"
They already created their one point perspective names as a warm-up (I'll try to post those today) and now they are taking notes on how to make a grid, windows, furniture, etc. They seem very interested and I do love teaching something that they enjoy like they do this. Seventh graders have started working on their African coil pottery. We looked at some images on the computer/projector and discussed the Ivory Coast and why people would make pottery or art in Africa. They will/have seen a demonstration on how to use the clay tools. We discussed animals in art and symbolism. I gave them a sheet that they fill out about what animals symbolize strength to them, which ones are quiet and peaceful, etc. They worked on thumbnail sketches designing their animal pots. It was fantastic hearing things such as "I'm going to make mine have a bat on it!" or "Can I have a panda actually holding a pot?" They were really brainstorming. We even had some who are going to make mystical creatures. Eighth graders (half) have finished their portraits. They worked on the notes, a pencil sketch, and a more colorful portrait. They had to turn the portraits in with a completed form... one that asks them to think about what they made, what media they used, and a few other questions. I had them grade themselves. I will take that into consideration when giving their final grade. Below is the video that we watched. The lady drew this portrait using everyday oil pastels (versus professional grade). I also did an example (it's easier for them to see the videos since there are so many of them in one class). One of the 8th grade classes started on portrait sculptures while the other class is still working on their portraits.